Josh arrived in Florida yesterday and he called me and he is having a really good time. They hadn't gone to the beach yet, so I am sure he will have lots to say next time I talk to him. 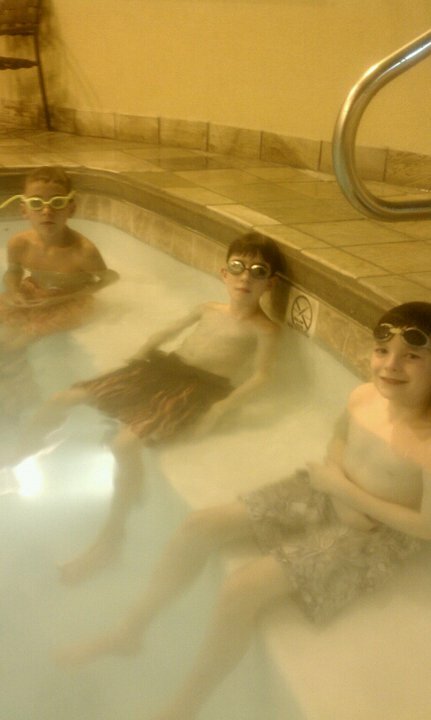 They took some pictures on the way down to Florida and they took one of all 3 boys in the pool. Josh is the one with his goggles on his forehead. I haven't seen many other pictures than that so far. They have posted to facebook on occassion. They are having fun, so I just check in every now and then. They stayed at Hattiesburg, MS on the way down and that is where the picture was taken. Today I am going to meet the teacher I will be student teaching under. I am really excited. I start that on the 23rd of August, but Josh starts school next week and I am going to work for a week. I also have to get him enrolled this week in school. I think I will work on that tomorrow. I have to fill out all of the forms etc. Then Wednesday Karl is taking off work and we are looking at some houses. I will let you know how that goes. Well, have a nice week. They are saying it may cool off into the 80's this week. It was back in the 100's over the weekend, so it is a welcome change. They say here in Missouri, if you don't like the weather, just wait until tomorrow...or it may be wait 5 minutes. Do they say that everywhere? Look how nice the three of them are relaxing. LOL! A new teaching job, that's really exciting. I'm happy for you. Hard to believe school starts up in a week where you are. Here it starts the day after Labor Day. Here the weather is in the middle to high 80's but the humidity is the killer. They don't say that here for if we don't like the weather it's just too bad. LOL!! I remember the student teaching days. I was so nervous - afraid the teacher I was with wouldn't like me, etc. It went well, though. It won't be long until you are finished! !